World Number Two and Seven-time champion Rafael Nadal moved into the last 16 at the Monte Carlo Masters with a 6-4 6-3 win over Jarkko Nieminen in the second round. Nadal was given a stern test in the opening set by the doughty Nieminen with a solitary break separating the pair, before the world number two brushed aside his battling opponent in the second to get his clay-court season underway in confident fashion. The Spaniard has completely dominated this tournament, winning it the last seven years since losing in the third round in 2003 as a 16-year-old to Guillermo Coria. Then after missing the event in 2004, he has won every year since 2005. Nadal now has an amazing 40-1 record at the tournament, winning 38 matches in a row, while he extended his head-to-head record against Nieminen to 7-0 – which includes a 69-minute, 6-2 6-2 rout at the same stage of last year’s tournament. 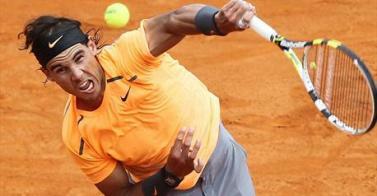 Nadal imposed himself in typically belligerent fashion as he broke Nieminen in the very first game of the match with a clinical assault on his opponent’s serve. But the world number two did not run away with proceedings as Nieminen showed real tenacity and resolve in persistently reducing the deficit with some tireless running and gutsy play around the court. Indeed, Nadal was given a real scare in successive service games as Nieminen forced each into deuce with a dogged resistance, but the Spaniard came through both unscathed. Nieminen had to save break points at both 4-2 and 5-3, but on each occasion he managed to hold serve and repel the relentless Nadal. Equally, the second seed was given a stern test as he served out for the opening set in clinical fashion with the crowd buoyed by the competitive, high-class play. Nieminen got a much better start in the second set as he held serve to lead from the outset, and suddenly the Monte Carlo crowd felt as though they could have another competitive set. But Nadal stepped up his intensity markedly to break the Finn’s serve in the third game of the set, and the demolition indicated that the Spaniard had previously been playing well within himself. A second break of serve followed as the clay-court master moved to within a game of victory at 5-2 with a flurry of breathtaking winners, and Nieminen began to look deflated and despondent. But the Finn was utterly inspired in the next game as he forced a break point at 30-40 with a blistering forehand winner, before sealing the game to haul himself back to within a single break of his opponent. The seven-time champion progresses through to the last 16 in Monte Carlo where he will face Mikhail kushkin who beat Filippo Volandri in their second-round clash.